Lent - What Are We Building? I believe in the Dignity of labour, whether with head or hand; that the world owes no man a liking but that it owes every man an opportunity to make a living. I believe in the sacredness of a promise, that a man’s word should be as good as his bond; that character not wealth or power or position – is of supreme worth. I believe in an all-wise and all-loving God, named by whatever name, and that the individuals highest fulfillment, greatest happiness, and widest usefulness are to be found in living in harmony with His Will. It’s a wonderful creed, which aims at the best for everyone. This glorying in human cleverness is incredibly positive, yet it was preceded by the slaughter of WW1, the tragedy of the Great Depression and was about to be followed by the gulags, the gas chambers and nuclear vaporization. What kind of faith manages to sing a triumphant hymn of praise to human beings when sandwiched by such huge, appalling examples of our inhumanity and brokenness? During the Holy season of Lent, we are confronted with that same juxtaposition of our incredible God-given nature as people. Our abilities and drives. Our striving for betterment. This is rammed up against our capacity for hatred and barbarism. Lent brings us up short, it reminds us of the bittersweet story of the whole of Scripture which commences with the wonder of creation, the paradoxical nature of human beings and their broken relationship with God the Creator who on every pages goes on saying - I love you, I long to be with you, will you be with me - in times of triumph, in times of deepest tragedy, personally, nationally or internationally. Lent is a time of, what the Orthodox, call ‘bright sadness.’ It is a gift from the church. It is a time for us to acknowledge humanity’s capacity for goodness but also a time to remove our fingers from our ears and the ears of our hearts and hear God calling in love to us again. It is a time to renew our relationship with him in prayer - listening to Him; in fasting - to remind us of our need of Him and our need to make time to be together; in almsgiving - in giving our time, talent, our riches, ourselves to others in need blesses them and us. My friend had a dream, having returned from New York’s skyscraper lined horizon, of a little child building a sandcastle, then another coming along and kicking it over out of jealousy. Heaven help us: human nature, in all its beauty, needs some fundamental healing and the longer we walk this planet, the more obvious it seems to me, that we cannot fix ourselves by ourselves. 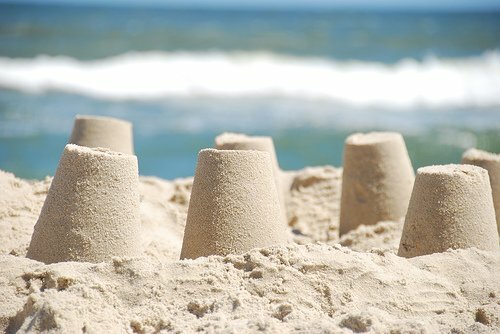 Lent reminds us of that fact, and of the God who loves us, but instead of standing aloof above us shaking his head at what we have done and what we have become, instead joins us on the beach and rebuilds the sandcastle with us.